Infinonymous: OK, Time For The Sunday Matinee . . .
OK, Time For The Sunday Matinee . . . The penultimate day of action places the Easterner with his new local braintrust (now including "the Loner," whose a llegiances seem to have shifted), juggling telegraphs and ledgers and last-ditch ideas, trying to conjure the basis for the last stand set to occur tomorrow, if at all. The local business interests that aligned with the Eastern financial interests earlier, when the situation seemed simpler -- K.L. Gates, the Irwin gang, Cohen -- can only watch, anxiously, as their prospective fortunes teeter. Even old man Morgan, who always has the angles in his favor (with an extra angle in reserve), is tense. The mayor, no longer welcome at the Easterner's conference rooms, simmers his resentment alone (well, maybe with a saloon gal or two). As the afternoon progresses, calculation turns to cursing. Cursing the missteps and misplaced allegiance s. Daming those do-gooders who had inexplicably organized and developed a spine. Cursing the suddenly needed time that can't be had. Cursing the unlikely confluence of circumstances that had turned a sure thing -- a damned profitable one -- into a trainwreck. Cursing, as nightfall approaches, a sense that destiny will be anticlimactic, with the best traveling gunslingers money can buy reduced to packing popguns. The foreshadowing is nearly one-sided, and nearly complete, but both s ides remain nervous. The great fortunes at stake recede from focus as the story line pans, as always, to studies in human character. See for me, this isn't a character issue so much as an ideological dispute. And it's not so much Gunfight at the O.K. Coral as it is ... Julius Caesar? The Day After Tomorrow? Agreed . . . a couple of months ago. So is the period during which a rational judgment could be made about a huge, complex, enduring financial transaction. Gone. Which leaves . . . . the human story. Perhaps, but it's probably nothing that watching the Time Warp a few times couldn't cure. 99% of human history is jabbing things with sharp rocks or pointed sticks (I looked it up on Wikipedia). So, yes. Looks like you had it nailed all along Infy. Impressive. More of a border skirmish today, actually. I reckon you got the story close to right. 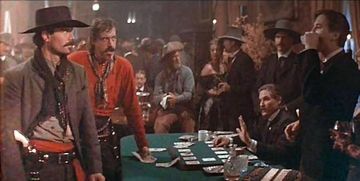 But as I heared tell things got rough when the loner, who had been invited in to a friendly game of five card, grabbed the arm of the Easterner as he reached for the pot, only to find a few extra cards in the Easterner’s sleeve. The Easterner caught the last coach with nothing more than the loner’s tobacco stain on his fancy suit. 8. Thomas J. Murphy, Jr.
. . . to be continued? Tip? Suggestion? Threat? Complaint? Correction? Starting A New Blog Adventure! OK, That Was Fun; Time For The Epilogue? Church + Popularity = Power, Then . . .
Keith Rothfus: Strong. Conservative. Lies.